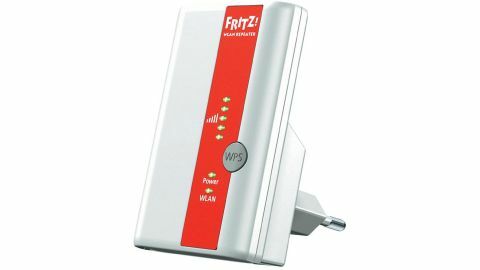 Wireless repeaters such as the AVM FRITZ!WLAN Repeater 310 are in danger of becoming something of an archaic oddity. Where once we used to need them to pick up our diminishing Wi-Fi signals and boost them in the far flung corners of our homes, we've now got powerline adaptors such as the excellent Devolo dLAN 500 AV Wireless+ that can circumnavigate walls with ease. Coupled with advances in Wi-Fi technology, from beam-forming antennae that consolidate and aim wireless networks to the new 802.11ac standard that sees increased range for home networks. So is the AVM FRITZ!WLAN Repeater 310 doomed before it's even been unboxed? Not necessarily. As much as we love a decent powerline adaptor, they're not much use if you want to get Wi-Fi in the garden, while getting the benefits of wireless AC will require an upgrade of most of your kit. The AVM FRITZ!WLAN Repeater 310 is small, compact and plugs directly into a power supply. Unfortunately, as with other AVM FRITZ! products, the AVM FRITZ!WLAN Repeater 310 hasn't got an official UK release, which means you need an adaptor to change it from a European power supply to a UK one. It's not the biggest of deals, but it does spoil the slimline aesthetics, somewhat. Unlike the earlier AVM FRITZ!WLAN Repeater 300E, there is no Ethernet port; this is purely Wi-Fi. A set of LED lights on the front shows you the strength of the Wi-Fi reception. This is handy for getting the placement of the AVM FRITZ!WLAN Repeater 310 right, enabling us to pinpoint a location with a signal that's weak, yet still strong enough to be able to boost it. If you're plugging the unit into a low down or difficult to reach plug socket, however, the LEDs on the face might be difficult to read. The WPS button on the front makes it simple to add to a wireless network without having to enter in any passwords. Once set up, the AVM FRITZ!WLAN Repeater 310 did an excellent job of finding and boosting our wireless network a further 10 metres, which isn't stellar but did mean we could get an internet connection in a previously Wi-Fi-free room. On the edge of the existing network, however, bandwidth was boosted, which meant where there was once a slow and anaemic internet connection, network speeds were much faster. Another solid network release from AVM. Don't expect miracles when increasing the range of your Wi-Fi, but if you want to give it a boost in strength in areas that it already reaches, then you won't regret buying the AVM FRITZ!WLAN Repeater 310.